Sprint BlackBerry Curve not out until June | BlackBerry Blast! 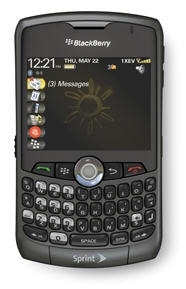 We heard rumors that Sprint would be releasing their version of the BlackBerry Curve on May 7, 2008. According to RIMarable today just isn't the day for Sprint. They called over to a local Sprint store and were told that the BlackBerr Curve would not be out until June 1. Bummer.